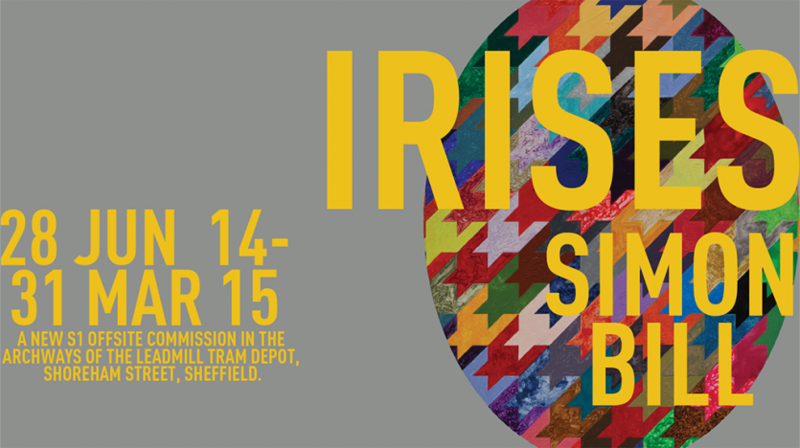 S1 Artspace has commissioned artist Simon Bill to create a major new work for the public realm, Irises, in which he transforms the seven archways of Sheffield’s iconic former Leadmill Tram Depot into a space for presenting a series of ambitious large-scale Op Art paintings. Irises explores the physical boundaries of the neon spreading illusion and its ability to fool us. This painting commission continues Bill’s interrogation of our understanding about what we are actually seeing and his endeavour to comprehend more broadly how vision operates. This investigation has developed from a long-standing fascination with Wittgenstein’s ‘duck-rabbit’, an established motif of cognitive indeterminacy that has appeared several times in Bill’s renowned paintings and sculptural works. Drawing on a wide range of sources including history, popular culture, music, philosophy, warfare, literature, cookery, comedy and science – Bill’s chosen subjects are succinctly brought together by the employment of oval shaped canvasses constructed from MDF board and polystyrene, a format he has continued to work with for over twenty years. This new series of paintings creates the space for Bill to further examine the workings of the visual brain through the phenomenon of neon spreading. The psychologist Richard Gregory has defined Optical Illusions as ‘systematic deviations from fact’ – in other words, we are seeing something we know is not right, however, this misperception is the reliable outcome from a particular set of circumstances that the brain has interpreted in a reasoned way. In the neon spreading illusion, first described by Dario Varin from the University of Milan in 1971, the coloured spokes at the intersection of an otherwise monochromatic grid appear to glow, as if they are bright neon, as opposed to regular coloured paint. The neon colour then appears to flow out of the intersections, producing the impression of a delicately tinted transparent veil hovering just above the pattern. Please note: this project is presented at the Leadmill Tram Depot, Shoreham Street, Sheffield and not at S1’s gallery. This commission has been supported by Alder King Property Consultants and The UNITE GROUP plc. Simon Bill, b. 1958, Kingston upon Thames currently lives and works in London. Selected solo exhibitions include: Lucky Jim, Baltic, Gateshead (2014); Simon Bill, Patrick Painter, Santa Monica (2012); Simon Bill Paints Like Black Sabbath, Patrick Painter, Inc., West Hollywood, CA (2010); BUTTERCUPS AND DAISIES, Patrick Painter Inc., Santa Monica, CA (2009); ODD, Figge von Rosen Galerie, Cologne; ODD, Stuart Shave/Modern Art, London (2007). Recent group exhibitions include Modernism has two faces, Mount Stuart, Isle of Bute (2011); The Long Dark, Kettle’s Yard, Cambridge and The International 3, Manchester (2010); The Sculpture Show, V22 Gallery, London (2009).